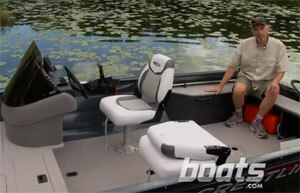 Fully updated for 2012, this fine-tuned fishing machine improves angling ergonomics. The new Crestliner 1750 Pro Tiller is a specialist, not a general practitioner. Like a bass boat or a flats skiff, the Pro Tiller is designed to excel at a particular kind of angling – the presentation of bait at low trolling speeds, especially when navigating over structure. 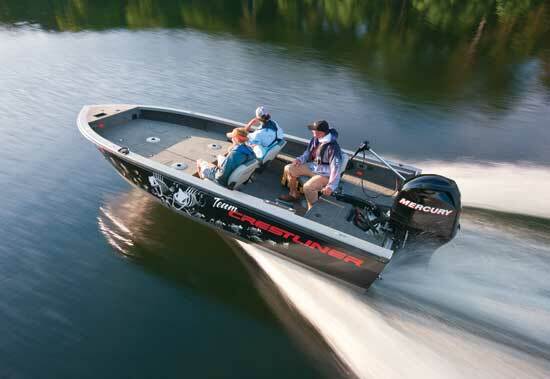 This is a boat for traditional walleye hunters. 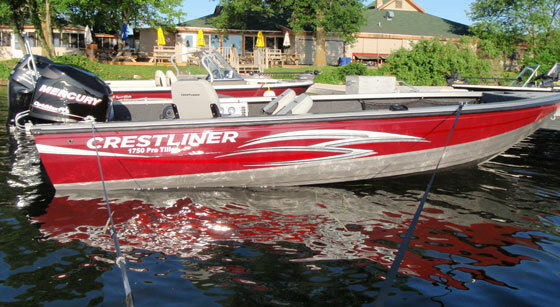 The 2012 Crestliner Pro Tiller 1750 specializes in slow-speed trolling, perfect for walleye hunters. There was a time when every aluminum fishing boat had a tiller-steer outboard, but that doesn’t make this new Crestliner old-school by any means. 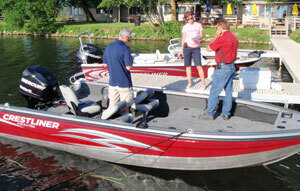 The company has worked hard to update its Pro Tiller series and keep it contemporary. 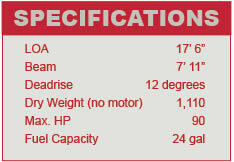 For 2012, Crestliner has made some significant changes to the 1750 Pro Tiller, the smallest model in that series. Deadrise at the transom goes from 17 degrees to 12 degrees. Crestliner says the flatter bottom increases top speed by about three mph. The shallower bottom also moves the deck up a little, and the freeboard was lowered, all towards a goal of reducing cockpit depth by three inches, from 25 in last year’s model to 22 inches for 2012. It’s now easier for the angler to work a rod over the side while sitting in the helm seat, and it’s also a shorter reach to the water. The downside, I suppose, is a little less security and perhaps a rougher ride in really bumpy water. The Command Console puts instruments and switches close at hand. New gas struts steadies the slide-out electronics platform. At the helm, the Pro Tiller is superbly functional, with access to electronics, bait, rods, the livewell, and engine controls all easily falling to hand for the angler. 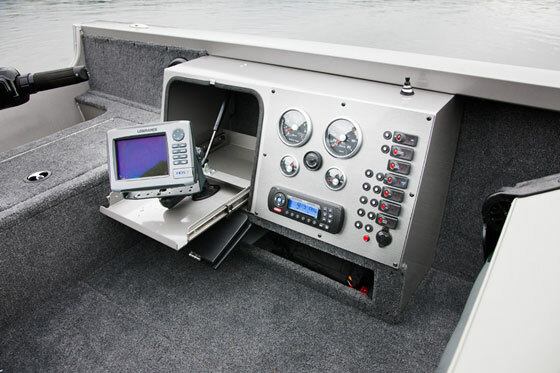 Grandpa didn’t have GPS and side-view sonar in his boat, so he didn’t need an electronics locker like the Crestliner Command Console. Located in the port inwale directly across from the helm, this console offers a clear view of engine instruments, and has a large locker for electronics. New this year is a gas strut on the sliding shelf of that locker that secures it in both its open and closed positions, a nice improvement over the thumbscrew found on previous Pro Tiller models. 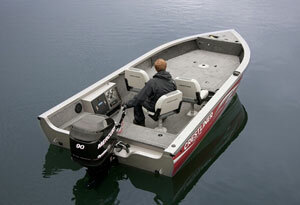 And to make sure this boat fits its owner, Crestliner ships it without mounting the helm seat pedestal. Find a location that works best, and the dealer will screw it down. The layout of the Crestliner 1750 Pro Tiller puts a Mercury outboard with Big Tiller handle in perfect position for fine boat control, with electronics in clear view. There’s a step up to the foredeck, and then this boat is just wide-open space, with plenty of room for another angler to jig or cast. Below that deck is a second livewell, storage compartments with lipped plastic liners to keep out rain and spray, and a center rod rocker that opens at the step and has tubes for seven-foot rods. Both this and the starboard rod locker actually do lock to keep gear secure. There’s also a baitwell on the bow peak. Though designed for trolling, the Pro Tiller is a capable platform for casting presentation, with a wide-open deck offering lots of elbow room. The max rating on this boat is 90 horsepower, but this same hull with remote controls rather than tiller steering could be rated for about 125 horsepower, according to Crestliner. 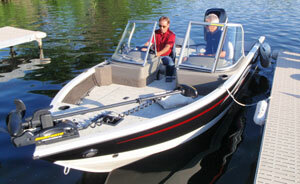 Power rating is determined by a formula that penalizes tiller-steer boats. That said, I was happy with the performance of this package, and 40 mph with a tiller is clipping right along. 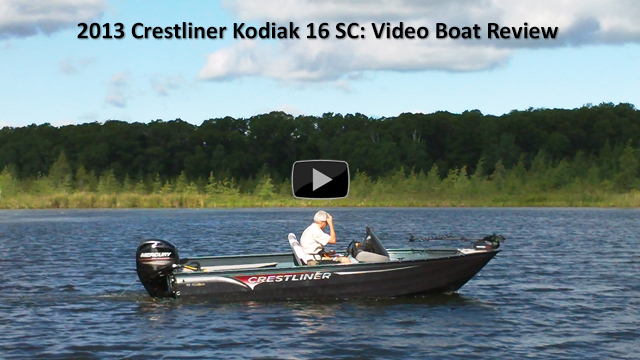 But this is why almost all pro anglers run a remote-control boat – so they can get a big motor and go faster. Like most of the V-bottom Crestliner models, the 1750 Pro Tiller features an all-welded, four-piece hull (two panels form the running surface, and two more form the hull sides), joined by aluminum extrusions with tongue-and-groove channels, which are then welded together. The extrusions double as spray rails and the keel. You can see images at Why a Crestliner. These boats do not have additional welded or riveted strakes, but seem to get on plane and handle just fine. For two days of testing we had little more than light lake chop, so I can’t comment on this boat’s rough-water performance. It does track well in a light crosswind at trolling speeds, an important trait for this type of boat. Another construction feature I like are the wide gunwale caps, which are big and stout enough to mount accessories, but also have a very attractive, smooth shape. Crestliner says the caps are extruded in a softer aluminum alloy to get that shape, and then heat-treated for hardness. They also have a “J-hook” groove instead of snaps to secure canvas. This boat comes with a painted ShorLand’r trailer. 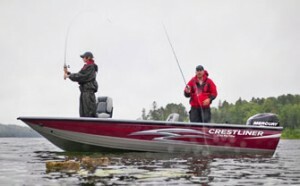 You don’t have to jig for walleye to enjoy the Crestliner 1750 Pro Tiller – I think you could persuade perch and bluegills to bite from this boat, too. But there’s no question this is a dedicated fishing rig. Weather protection is non-existent, passenger comfort is not a high priority, and you’d get more performance with a remote-control motor. 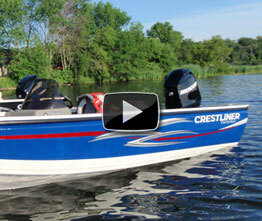 But if you’re looking for a modern platform for old-school angling, this Crestliner deserves a good look. 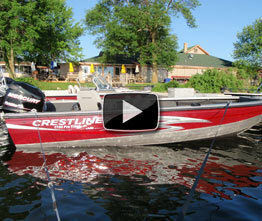 For more information, visit Crestliner Boats, or watch the Crestliner 1750 Pro Tiller Video Boat Review.